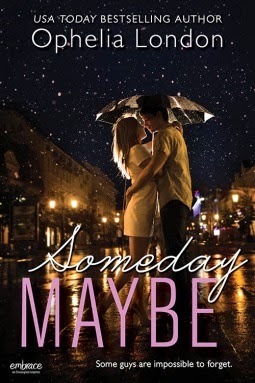 So first off books like Someday, Maybe totally stress me out! Don’t worry it’s not a bad thing. I love Ophelia London’s writing and her way of investing me in the characters. So I’m stressed because I want things to work out for the characters right away. Of course that wouldn't be much of a story. Rachel is a very interesting character. It bothered me that she was letting her brother, Roger, have such an influence on her life. I have three older brothers and I can tell if any of them put their two cents in that way, I would give them a good punch in the stomach. (okay the truth is I just never told them anything otherwise they would be beating up boys left and right). Although as you read you start to see that it is more her than Roger and she really does grow and sees that. I did enjoy Rachel, even if at times she was frustrating or irrational. She has some control issues which are not the most uncommon thing. I like how Ophelia keeps some of that natural quality to Rachel as she did with Spring. Using the essential oils to aid in her headaches and stress. I did not like Meghan and I felt bad about it because I thought I was disliking her for something that she didn't know the full situation on. How could she know about Oliver if she was never told about Oliver, but it felt like even if she knew it wouldn't matter. I don’t like girls who tell you to tone it down because they don’t want the guy they like to like you. What? How is that the right guy for you then. Her insecurities bothered me but I've also known people like Meghan. In the grand scheme of things Meghan is dramatic but she is not a bad friend. I like that she is Rachel’s go to for dream interpretation. How could you not like Oliver or Ollie or Rad or whatever he goes by these days. Ha ha. He is super charming and super sweet. He, however, is not a hundred percent perfect. You could tell that he was still bitter at Rachel but not heartless toward her. I thought the way they ran circles around each other instead of actually confronting one another is pretty funny. I actually have not read Jane Austin’s Persuasion and honestly I’m not sure why. Unless I have and forgotten it, I did look up the summary though so I definitely see how this is a modernized version of the story. Including the clever naming of Oliver. Like I said earlier this story stressed me a bit but I felt better when Nick entered the picture. Even Sarah for that matter. It gave it a little more balance. I loved the pacing, the writing and the plot for this book. Rachel has her quirks but it’s also about how she learns that she can’t control everything. I thought the dream thing was interesting because I’m a big believer in intuition and such things. So I think if you are looking for a fun romance, definitely give this one a try.